Joachim Loew, lucky to still be at Germany's helm following its 2018 World Cup debacle, has a crucial six weeks ahead of him. Coach of Die Mannschaft since succeeding Jurgen Klinsmann after the 2006 World Cup, Loew guided Germany to the 2014 World Cup crown, but followed up with a disappointing semifinal exit at Euro 2016, and Germany's worst World Cup in 80 years, when it failed to reach the knockout stage in Russia. Germany's federation, the DFB, had before the 2018 World Cup renewed Loew's contract through the 2022 World Cup at a reported annual salary of a $4.4 million. Germany plays world champion France Sept 6, Peru Sept 9, and the Netherlands Oct. 13. The games against France in Munich and the Dutch in Amsterdam are League 1, Group 1 games of the new UEFA Nations League. The last-place finishers in the three-team groups in League 1 get relegated to League 2, and that affects the seeding for Euro 2020 qualifying. Loew had boasted about Germany's younger generation after the 2017 Confederations Cup win, but his faith in the old guard failed him at the 2018 World Cup. 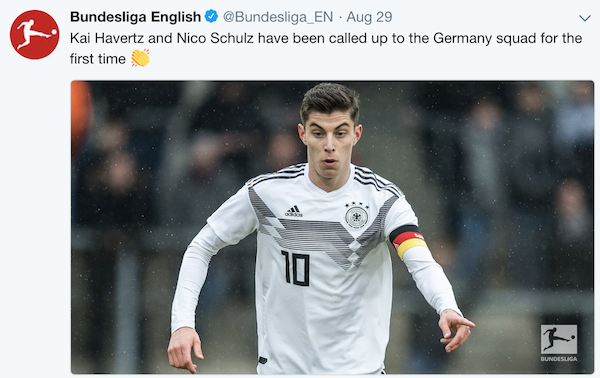 Yet his 23-player roster for the France and Peru games includes 17 players from the 2018 World Cup and only three debutants: Thilo Kehrer (Paris Saint-Germain), Nico Schulz (Hoffenheim) and Kai Havertz (Bayer Leverkusen). Three previously capped players who weren't part of the World Cup are back in the squad, including Manchester City's Leroy Sane, the 2017-18 English Premier League Young Player of the Year, whose omission from the 2018 World Cup squad boggled the mind. Upon announcing his latest squad, Loew took responsibility for the failure at the 2018 World Cup, at which losses to Mexico (1-0) and South Korea (2-0) sandwiched a 2-1 win over Sweden. "My biggest overestimation was that we would reach at least the next round by dominating games," Loew said. "It was almost like arrogance, I wanted to persist with this tactic for too long and I kept trying to perfect it. I did not set up the team to play a certain way, whereas in 2014, there was a balance. “Possession in the league is important but at knockout events there needs to be an adaptation. That was my biggest mistake. That I believed with this dominant possession game we will go through the group stage." Loew also admitted he failed to motivate the team. "We failed to provide important stimuli for the players," he said. "We only had a small flame, when my players usually have a fire. It would have obviously been my job to demand more from them. When we can get the right balance by reigniting the fire and passion, we will have strong foundations for the team." Popular theories in Germany for the Russia debacle included the notion that the players who already won a world championship were complacent -- and that Loew is plagued by a weiter so (stay the course) approach. That he's too reluctant to shake things up. Unlike French coach Didier Deschamps, who so obviously embraced and connected with his young players, Loew deputized the likes of Toni Kroos, who had been publicly critical of the younger players. German media also reported a rift between the veterans and the youngsters who won the Confederations Cup while the 2014 World Cup champs rested during the summer of 2017. If it's not different come October, the DFB will have to realize the perils of staying the course. 12 comments about "Germany stays the course with Joachim Loew -- for now". frank schoon, August 31, 2018 at 10:12 a.m.
A lot of gobbly gook, general stuff , that says nothing. Here is what he said. He stated just about every country played defensively, that most games were decided by a counter or dead ball play and as result we have to be better prepared for those eventualities. Bob Ashpole replied, August 31, 2018 at 11 a.m.
Frank, I think you have to consider that in the group stage of the finals, teams do tend to play to avoid losing rather than playing to win. On the other hand few teams after winning the first match fail to advance. What he said makes sense in that light, but that doesn't alter your point about matches being won or lost based on technical advantages in the individual battles. The point you didn't make was that the greatest teams are flexible--they can dominate play multiple ways not just one. But dominating play is like breathing air. Goes without saying. frank schoon replied, August 31, 2018 at 11:27 a.m.
Bob Ashpole, August 31, 2018 at 12:20 p.m.
frank schoon replied, August 31, 2018 at 1:19 p.m.
Bob, Catenachio came about in Italy due to certain teams having lots of money and could get what they want, therefore the poorer teams had to combat this. The Argentinian Herera thought this up. The Italians got good at but it took a team like Ajax with an offensive philosophy to break it up. A good game to watch is Inter-Ajax 1970. If you watch AC Milan-Ajax in 1969, you'll see Ajax play very naive althougy offensive and got beat but the next they took the Italians to task. frank schoon replied, August 31, 2018 at 1:25 p.m.
Bob Ashpole replied, August 31, 2018 at 7:11 p.m. Seemed obvious to me that coaching attacking play (attack and transistion to attack moments) is different than coaching defending (defense and transistion to defense moments). Yet I don't see any discussion of that in coaching courses. On one hand a coach nurtures creativity and unpredictability and on the other hand a coach instills discipline and predictability. frank schoon replied, August 31, 2018 at 10:08 p.m.
uffe gustafsson, September 2, 2018 at 10:24 p.m.
most of the games where good attacking soccer. not like the 94 WC w Italy parking the bus and went on to the final that probably the worst I ever seen. germany clearly had some internal issues like France had some years ago and both failed miserably. team chemistry is vital in WC. frank schoon replied, September 2, 2018 at 10:39 p.m.
frank schoon replied, September 2, 2018 at 10:43 p.m.
Uffe, I meant To say Joachim Loew, that you also are disagreeing with as far as pertaining to the defensive nature of this WC. R2 Dad, September 4, 2018 at 1:52 a.m. I think Gotze, who has been a dissappointment since the 2014 WC, was the warning sign but they played him through 2017. 2018 saw Neuer get the call even though he wasnt fit and didnt play for about a year before the WC. Khediera lost a step or two and was completely overrun. Ozil has struggled at Arsenal but Loew played him, too. I don't think Brandt has the required quality, but Loew wanted him for the chemistry in the dressing room since Sane was perceived as the disrupter. The core was too old for this young man's game, and Loew didn't have the huevos to sit the guys in 2015 who didn't retire after the '14 WC.